Posted March 5, 2015 by Norburn Lighting and Bath Centre & filed under Sales and Promotions . 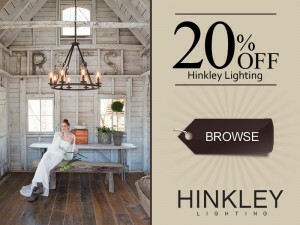 Save 20% on All in-stock and special order fixtures from Hinkley Lighting. From the first glimmer of light across the morning sky to the soothing dusk that envelops us at the close of another day, our lives are made richer by the radiance of light. Light creates different perspectives, rekindles emotions and provides protection. It makes us joyous, rejuvenated, relaxed and celebratory. Light inspires our outlook and our lives, brightening each moment spent with family and friends. The folks at Hinkley Lighting are committed to keeping your life illuminated, enlightened, aglow. Hinkley Lighting began in 1922 as a small family lighting company and has developed into one of the most well-respected designers and manufacturers of high-quality lighting fixtures in the world. Continuing with a fourth generation of visionary leaders in the lighting industry, Hinkley Lighting continues to evolve while maintaining its tradition of superior design and enduring quality.